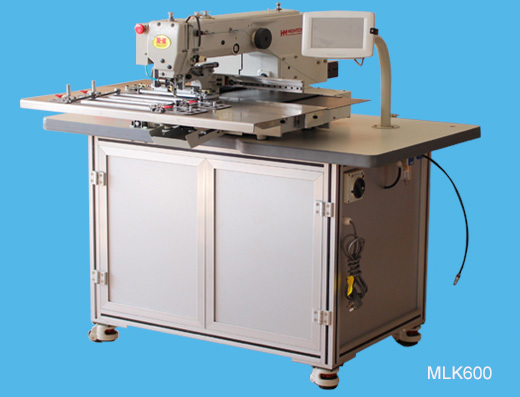 Der MLK600 ist ein frei-programmierbarer elektronischer Nähautomat mit Direktantrieb. 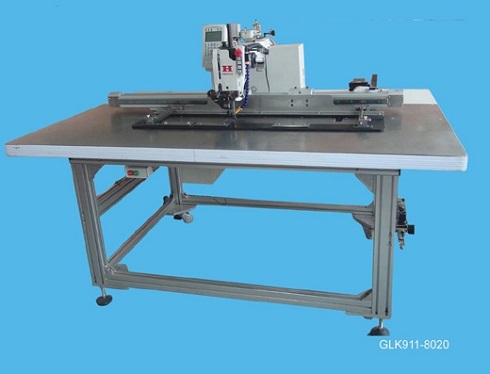 Diese Industrienähmaschine bietet hohe und gleichbleibende Nähqualität bei außerordentlich hoher Nähgeschwindigkeit. Gleichzeitig ist sie energiesparend. Der größere Nähbereich bei diesem Riegelautomat eignet sich für ein breites Spektrum an Materialien z.B. 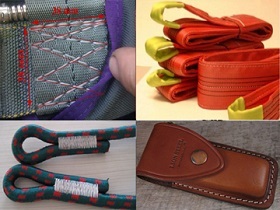 Gurtband, Leder, kaschierte Ware, Kunststoffe etc. über das Maschinenbedienfeld kann das gewünschte Nahtprogramme einfach vom Maschinenbediener aufgerufen werden. 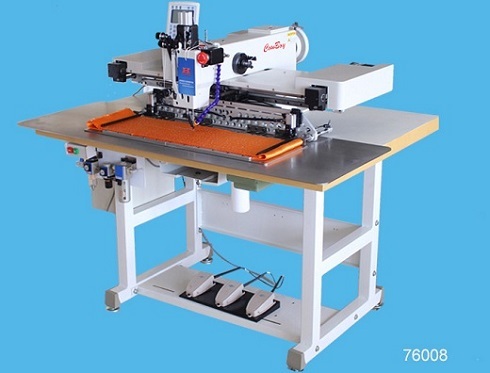 Hochwertiger Freiprogarmmierter Nähautomat mit einem Nähfeld von 300 x 200 mm von Hightex für extra schwere Materialien / Garne Extra Stark #8(=T-270, V277, 840dx3). 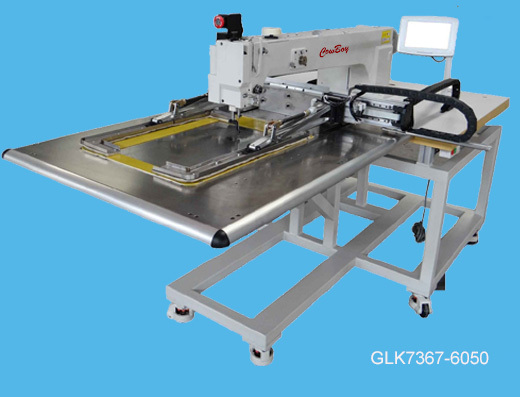 Hochwertiger Freiprogarmmierter Nähautomat mit einem Nähfeld von 350 x 200 mm von Hightex für extra schwere Materialien / Garne Extra Stark #8(=T-270, V277, 840dx3). 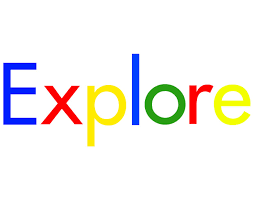 Mit extra großem Doppelumlaufgreifer, Fadenabschneider, Fadenwischer, pneumatische Stoffhalteklammer mit max. 30mm Lüftung, Presserfuß mit max.15mm Durchgang unter Fuß, Nadel 135x17#25. Motor eingebaut, Geschwindigkeit max. 1600 Stiche/min., Luftverbrauch 1,8Ltr./min, 0,5 Mpa. Bei der Fertigung von Sicherheits-, Zurr- und Lastengurten werden aufgrund der Verarbeitung extremer Nähgut- und Garnstärken höchste Anforderungen an die Betriebsmittel sowie an die Sicherheit und Belastbarkeit der Nähte gestellt. 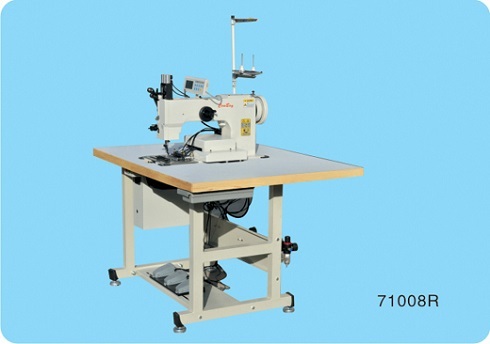 Die robuste Konstruktion und der durchzugskräftige Antrieb dieses Riegelautomaten 71008 ermöglicht eine hohe Fertigungsleistung bei exzellenter Nahtqualität. 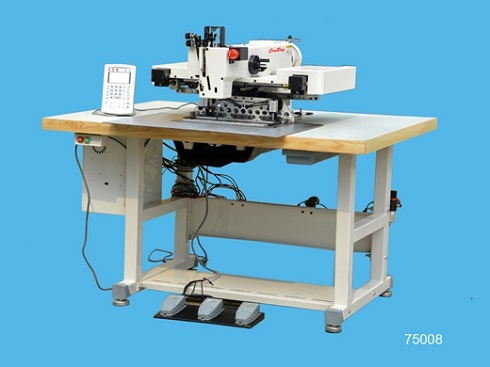 75008QS: Heavy duty wide area automatic pattern sewing machine for sewing lifting loops (handle) on reinforced straps for the body fabric of Big Bag (FIBC). 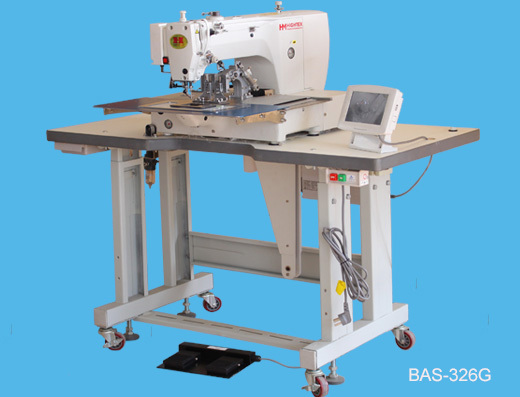 Features: The second generation of extra heavy duty automatic pattern sewing machine and bar tacking machine-highly specialized electronic control systems, robust construction and sophisticated device for perfect seam quality & maximum productivity; Long sewing cycles by barrel shuttle with large bobbin capacity, even sewing with extremely thick thread; The specialized sewing automation improves quality, lowers production time and reduces operator involvement. 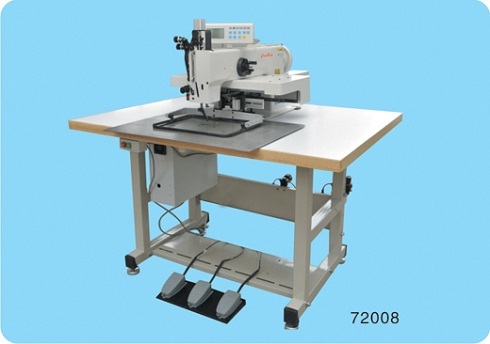 In many cases it is possible to run two or three automated sewing units with only one person, great for saving labor cost; Can easily sew 2-4 ply synthetic webbing slings (3.5mm of each) together or stitch 2 ropes with each of 20 mm(diameter); Excellent stitch pattern and constantly tight stitches; Closed-Loop Control Type; High clamp lift and large needle penetration power allow the processing of extremely thick materials, such as Nylon, Polyester, Polypropylene, Webbing, Kevlar, Vinyl, Leather and Canvas. 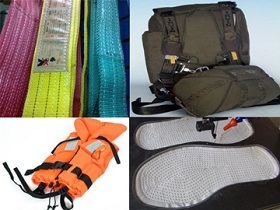 Applications: pattern tacking synthetic lifting slings, cargo lashing straps (Ratchet Tie Down), seat belts, safety harness, military equipment, backpacks, crane slings, lanyards, spanzet, nets, safety belts, upholstered furniture, leather goods, sofas, life vest, fall protection equipment, industrial safety products, rigging products, saddles, tents and canopies, sails and parachutes. 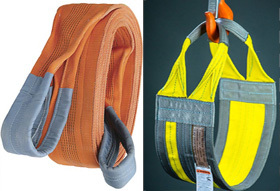 Bartacking ropes and cordage for Arborist climbing ropes, Climbing & Caving Ropes, Boating & Marine Ropes and Rescue Ropes. 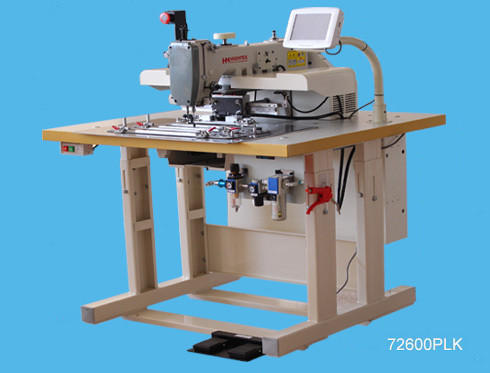 Features: Long sewing cycles by barrel shuttle with large bobbin capacity, even sewing with extremely thick thread; The specialized sewing automation improves quality, lowers production time and reduces operator involvement. 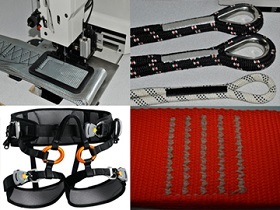 In many cases it is possible to run two or three automated sewing units with only one person, great for saving labor cost; Can easily sew 2-4 ply synthetic webbing slings (3.5mm of each) together; Hardware including Ratchet, shackles, thimbles, choker triangles and others can be sewn into the slings for varying applications; Excellent stitch pattern and constantly tight stitches; Low in maintenance due to its automatic lubrication systems. 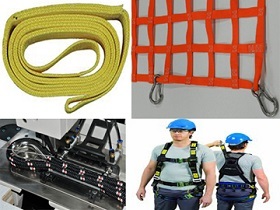 Applications: Nylon or Polyester lifting slings, cargo lashing straps (Ratchet Tie Down), aircraft arresting gear tapes, seat belts, safety harness, military equipment, backpacks, crane slings, lanyards, spanzet, webbing cargo nets, safety belts, upholstered furniture, leather goods, sofas, life vest, fall protection equipment, industrial safety products, rigging products, saddles, tents and canopies, sails and parachutes. 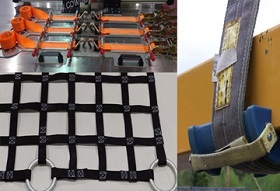 Applications: pattern tacking parachute harness (below demo video is for sewing 4-ply Mil-W-4088K type 26 military spec Nylon webbing). 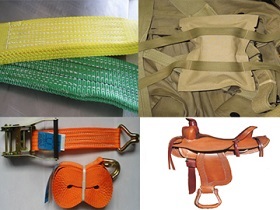 synthetic lifting slings, seat belts, safety harness, military and tactical gear, backpacks, crane slings, lanyards, life vest, fall protection equipment, pipe slings, Aircraft Arrestor Tapes, industrial work boot applications and heavy duty equestrian harnesses, rigging products, saddles, bulletproof vest carrier, body armor. 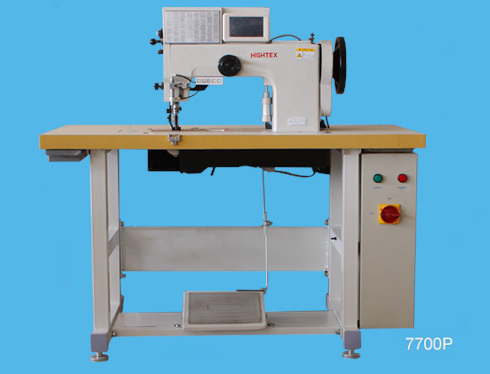 Features: High sewing speed up to 1600 RPM; The presser foot has an extra high lift and can go up to 18mm, allowing for a large range of extra heavy weight material to be used; The automatic lubricating mechanism dramatically improves maintainability of the machine; Equipped with largest horizontal axis hook and extra large capacity bobbin (3 times); Can easily sew 2-3 ply synthetic webbing slings (3.5mm of each) together; Long needle bar stroke creates strong needle penetration force and extraction force, is capable of stitching various synthetic materials; Ready to operate! 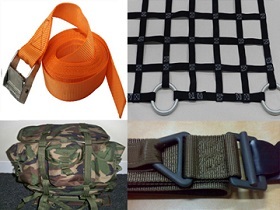 Applications: webbing slings, lifting straps, ratchet lashing straps, belt attaching on a container bag (FIBC), enforcement belt sewing for jumbo bags, large size parts sewing for Big Bag, webbing cargo nets (cargo Netting and safety nets), military and tactical gear, bulletproof vest carrier, body armor, carpets, safety harness, fall protection equipment, upholstered panels wall, headboards, automotive seat cushions, aerospace upholstery. 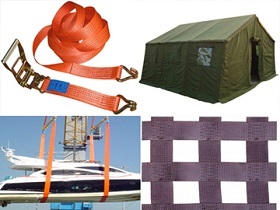 Applications: large size thick and rigid materials such as Aircraft Arrestor Tapes (tapes for aircraft arrester gear), webbing cargo nets (cargo Netting and safety nets), military and tactical gear, bulletproof vest (bullet resistant vests), body armor, fall protection equipment, heavy duty lifting slings for boats and other offshore applications, tents and canopies, mattress, upholstered panels wall, headboards, automotive seat cushions, aerospace upholstery, Tatami mats, heavy industrial slings and other custom heavy duty sewing applications. 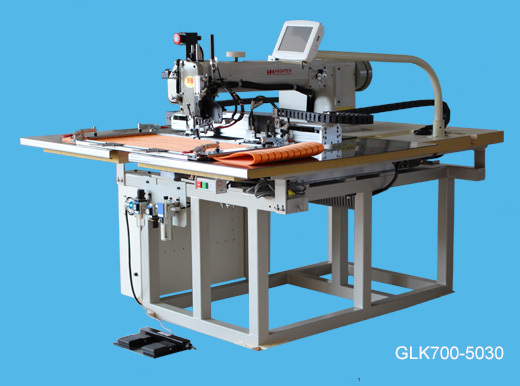 Features: Following on from the success of the Hightex GLK 700 and 800 series heavy duty programmable pattern sewing machines, Hightex have developed the MLK series light to medium weight automatic pattern sewing machines for clothing, leather and textile industry. 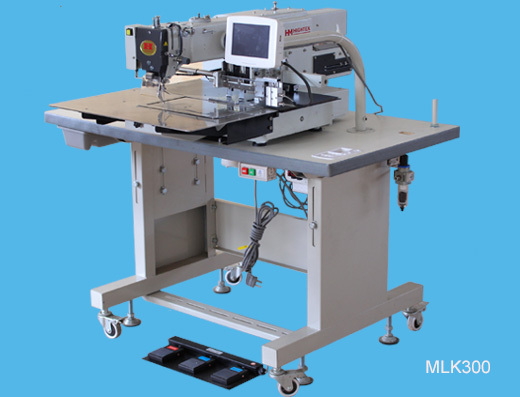 This Hightex MLK series features the latest Direct Drive system with a servo motor fitted as part of the sewing machine head; this improves sewing acceleration while greatly reducing power transmission losses and results in energy savings of up-to 40% when compared with conventional machines. 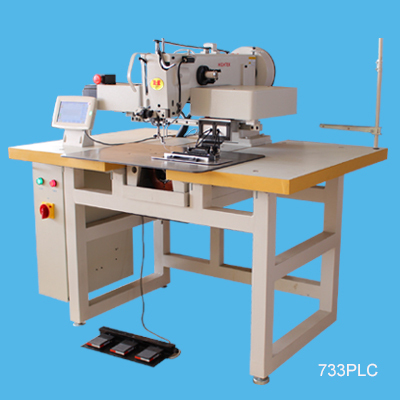 Sewing patterns, stitch numbers and stitch length can be set with-in the sewing area using the included hand held programming unit with clear LCD screen and easy to follow icon driven menus. 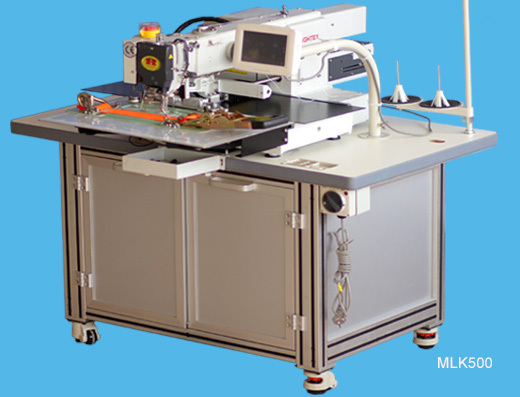 The adoption of the universal serial bus (USB) makes programming, updating and storage easier. 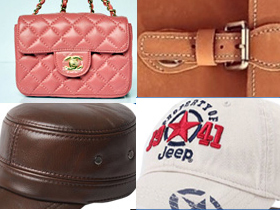 Widely available inexpensive Flash Memory sticks can be used. 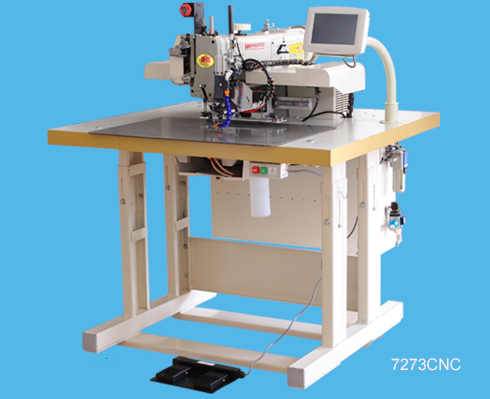 Application: single color embroidery, functional or decorative stitching on jeans, clothes, bags, shoes, webbing slings, lashing straps, upholstered walls, luggage, leather jackets, and attaching label, widely used for many different industries. 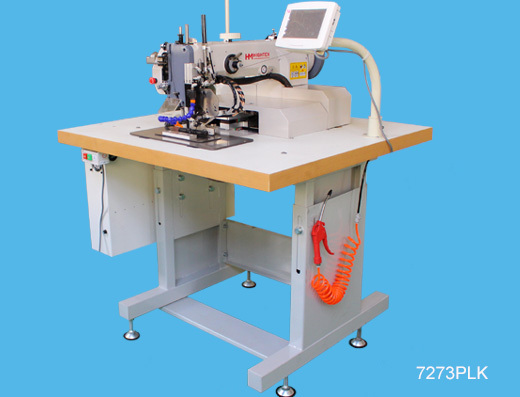 Der HighTex BAS-326G ist ein frei-programmierbarer elektronischer Nähautomat mit Direktantrieb. Diese Freiprogrammierbarer Steppstich-Nähautomat bietet hohe und gleichbleibende Nähqualität bei außerordentlich hoher Nähgeschwindigkeit. Gleichzeitig ist sie energiesparend. Der größere Nähbereich bei diesem Riegelautomat eignet sich für ein breites Spektrum an Materialien z.B. 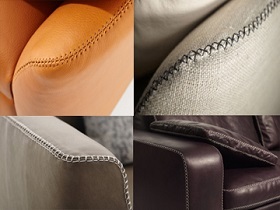 Leder, Gurtband, kaschierte Ware, Kunststoffe etc. 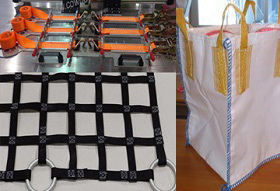 Auch bietet dieser Nähautomat Möglichkeiten für eine Reihe von Anwendungen in der Produktion von Taschen, Hitzeschutz, Bekleidung, Ladungssicherung etc. Die Nähprogramme können individuell mit einer separaten Software erstellt und verwaltet werden. Über das Maschinenbedienfeld kann das gewünschte Nahtprogramme einfach vom Maschinenbediener aufgerufen werden.